This book examines the life of a scarecrow, taking the reader from its construction to its daily activities like interacting with garden creatures. 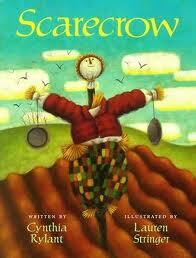 The scarecrow shows great patience and perseverance, and we see how valuable those traits can be for a gardener. Children will enjoy watching the gardening process through the eyes of the friendly scarecrow.